Times when the range of coolers for Socket A was narrow are gone. The distributors have successfully ploughed up this field and now it bears hundreds of decent models in contrast to just several dozens available on the market quite a short time ago, and only several ones had really good quality. A rich marketing mix is a gigantic advantage for a buyer, but very often it turns into a real torture even for experts: how to pick the right one. 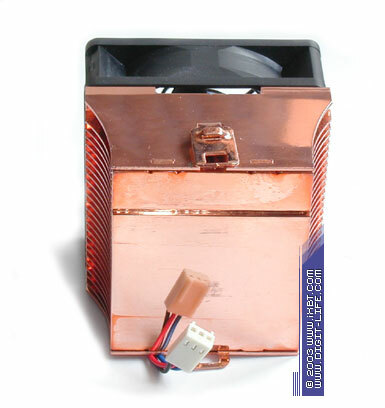 Being eager to help you in this struggle, we tried to cover as many coolers for Socket A as possible - they are the coolers currently selling and expected in the near future. We used almost 70 products from ten top brand makers and carried out a complex analysis of their consumer properties in accordance with our testing technique. So, let's turn to the results of this titanic work and see what the market offers and how useful and interesing for a consumer the tested solutions are! The ADDA B53 attracted our attention two years ago. But it still lives and got almost no modifications: the same cold-forged heatsink of 74x63x52 mm with not bad fin parameters and a high-speed fan of 60x60x15 mm of high quality. In its time ADDA B53 perfectly cooled down Pentium III/Celeron, so does it today showing decent effectiveness on the AMD's platform. But its high-speed fan makes quite a lot of noise according to the today's standards which lowers its positions in the overall rating. Its dimensions are suitable for most mainboards; although the clip is not very handy, the hold-down pressure is within the AMD's requirements. Like before, the cooler comes with Dow Corning 340 grease. AVC (Asia Vital Components) is not wide-spread on our local market including new retail models like AbsZero, Tundra 2 etc. But some budget models are still on sale. Among them are AVC 112BJ0-1 and 112BJ0. AVC 112BJ0-1 sports a good design. 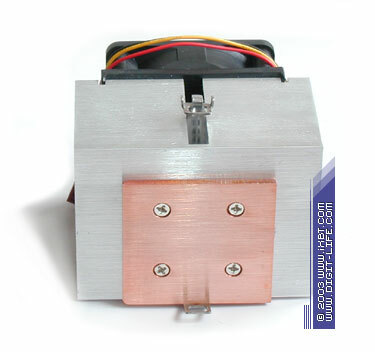 This is a light extrusion heatsink of 78x63x30 mm with good fin parameters, a fan of 60x60x11 mm of rather good quality (by the way, AVC's fans always had decent quality of the mechanical part), and a standard handy soft two-pin mount. Its thermal effectiveness is not depressing either - as a result, its position in the rating is far not bad. However, the AVC 112BJ0-1 has a very high noise level for its class (53 dBA). I didn't expect it from such a small thing rotating at a relatively low speed (5400 rpm). Probably, it's because of the aggressive impellar design meant for a big air flow). Although the cooler is "Recommended by AMD" I wouldn't give such recommendations. 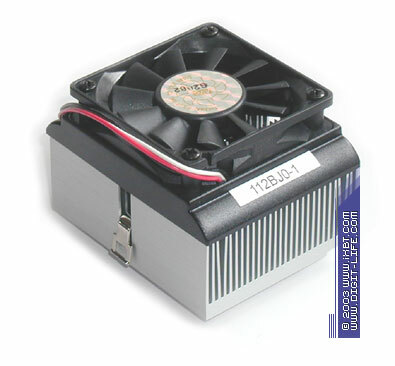 Its sibling - 112BJ0 differs only in the fan (this one rotates at 4800 rpm). Its thermal effectiveness is not noticeably worse. However, the noise is not much lower , - and this affects its functionality and places the 112BJ0 into the bottom of the technical rating. Cooler Master DP5-6I11A, DP5-6I31A and DP5-6I31C were tested before and demonstrated decent functionality and good quality for the budget class. Although these coolers are out-dated, they still have good strength margin. With primitive heatsinks and weak fans, the DP5-6I11A, DP5-6I31A and DP5-6I31C are not the worst among the today's contestants and keep up with some modern coolers. Although their functionality makes them outsiders (they can be used only for AMD Duron and junior Athlon XP ), it doesn't prevent them from taking good positions in the final economical rating at the expense of low prices. DP5-7H53F is not young either and will soon retire. 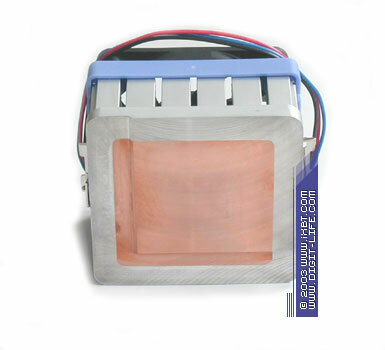 However, the extrusion heatsink of 80x68x38 mm (80x61 mm base), powerful high-quality fan 70x70x15 mm (from Delta Electronics) and handy 6-pin mount with normal hold-down pressure do not look obsolete. Despite the "old-fashioned" fin parameters DP5-7H53F shows decent thermal effectiveness and doesn't make much noise (due to high-quality mechanical and aerodynamical design of the brand-name Delta AFB0712HB fan). As a result, it gets a high position in the final rating. DP5-6J31C, CP5-6J31C, CP5-6J11C and CP5-6J11C-0L (low-noise version of CP5-6J11C) are the new generation of budget coolers from Cooler Master. Actually, they are an extension of the good old DP5-6I31C. The DP5-6J31C also carries a fan measuring 60x60x13 mm but its heatsink is more advanced - (80x60x46 mm against 80x60x40 mm) with much improved fin parameters (0.7 mm thick, 35 mm high, 18 console factor). CP5-6J31C, CP5-6J11C and CP5-6J11C-0L have one more improved thing - copper plate of 50x48x3 mm attached to the heatsink with bolts (the latter has a quieter fan of 60x60x25 mm). The new modernized coolers are much ahead in thermal effectiveness and show decent results (beyond average), without much noise. But all their advantages are spoiled by a very inconvenient mount. 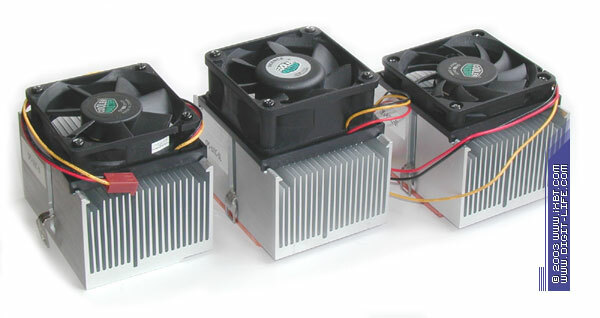 It's very difficult to install the new coolers and almost impossible to demount them without tearing off the fan! A novice can easily break a socket's tooth or damage the processor's core. According to our estimation system DP5-6J31C, CP5-6J31C, CP5-6J11C and CP5-6J11C-0L get fined and go down the final rating. I hope the mount will be changed (I don't understand why they refused the old version from DP5-6I31C) because the coolers themselves have good thermal effectiveness. Together with budget models Cooler Master offers high-grade solutions which belong to the retail edition category and are positioned for demanding users. Some of such products have settled down on our local market - HCC-002 and HSC-V62. HCC-002 looks like a promising solution. 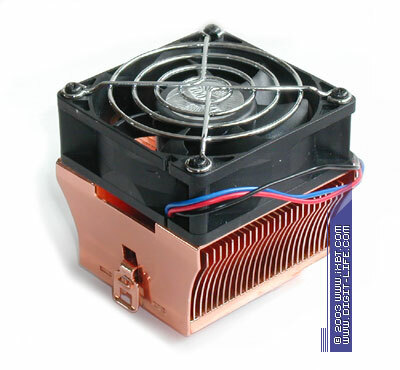 Its solid copper heatsink, 63x60x34 mm, based on the bonded fin technology, powerful fan, 60x60x25 mm, and handy mount make a fairly good impression. The HCC-002 has rather good thermal effectiveness but its noise is too loud and comes to 55 dBA. 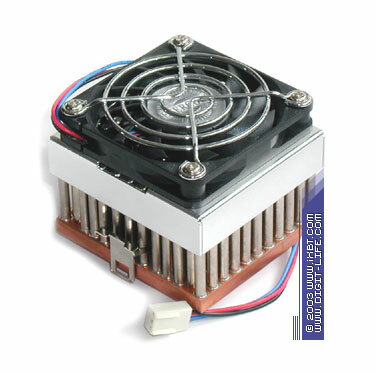 Besides, its heatsink's weight doesn't match the parameters of the mount used, and the processor/heatsink thermal contact is weak, making impossible to use the cooler to its full capacity. Moreover, the HCC-002 is much overpriced - the price is unjustified taking into account its functionality. In contrast, the HSC-V62 has a worthy exterior and nice functions. It sports an advanced copper heatsink, 63x63x30 mm with excellent fin parameters based on the skived fin technology. It's lighter and its base is better processed than that of its predecessor, - thus, it stands a chance to bring its potencial into reality. Another peculiarity of HSC-V62 is the fan with temperature control the impellar's speed of which doesn't exceed 4500-4700 rpm in real conditions. The noise level is acceptable, and the enhanced heatsink helps it to show pretty nice effectiveness. HSC-V62 takes a position in the top ten in the technical rating but its too high price leaves no chance for it to get a high position in the economical rating. 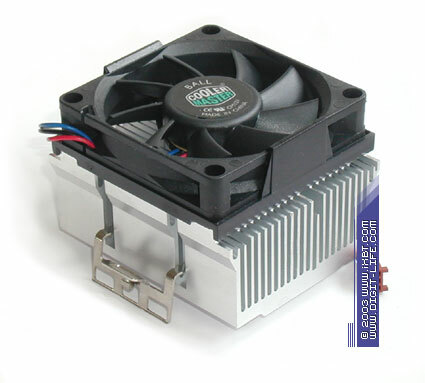 Some Evercool coolers (for Socket 478) were tested before and showed themselves pretty well. 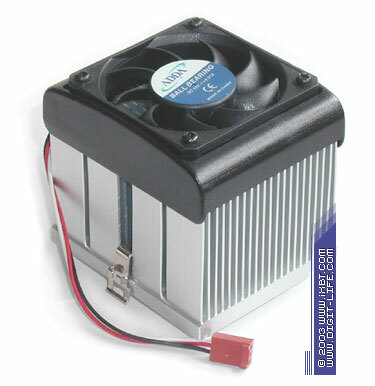 Evercool also offers a broad line of coolers for Socket A with budget and advanced models. 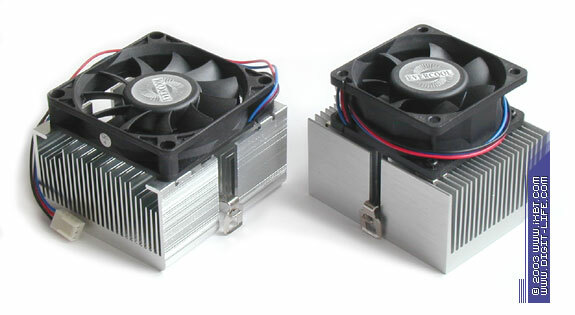 ND12-625 and ND15-715 are two bright examples of budget solutions from Evercool. ND12-625 has nothing outstanding: old-fashioned extrusion heatsink 80x63x40 mm with ordinary fin parameters, average-quality fan, 60x60x25 mm and typical two-pin mount. As expected, ND12-625 doesn't bring top scores in performance, and the performance/noise ratio puts it into the last positions. ND15-715 looks more interesting. A solid extrusion heatsink, 80x73x40 mm, with rather good fin parameters and a fan, 70x70x15 mm, of fairly good quality leave a pleasant impression. The ND15-715 shows worthy performance and produces less noise, allowing it to take pretty high positions in the finals. 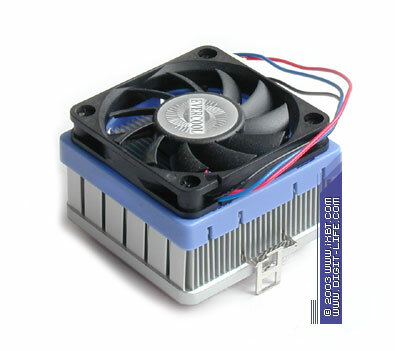 However, the large heatsink dimensions can prevent its installation on some demanding mainboards. Now the advanced solutions. ND16-610 is a really intruguing product. It has a hi-tech heatsink: the copper base, 63x60x5 mm, has 135 aluminum pins soldered in which are 3mm in diameter and 30 mm high! Being small and with a realtvely weak fan, 60x60x10 mm (5200 rpm), ND16-610 shows decent performance almost equal to the leaders in this round thanks to the enhansed heatsink. 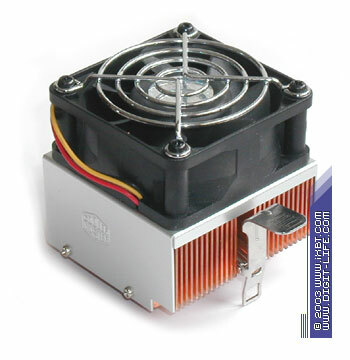 But its noise is quite loud and the mount is not very handy and is not a good match for the heatsink's weight. As a result, it affects its overall functionality. 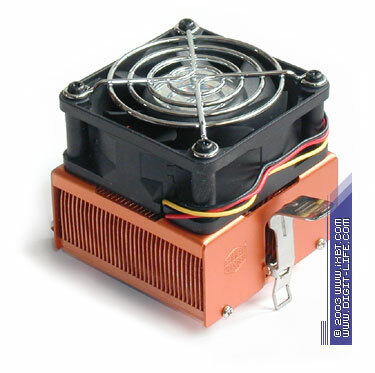 CUC-610 is more modest: it has a compact cold-pressed heatsink, 63x63x30 mm, with pretty good fin parameters and a fan, 60x60x10 mm, rotating at 4600 rpm. But it also has a peculiar feature - a copper plate in the heatsink's base. CUC-610 demonstrates worthy performance especially considering its toy-like dimensions (a compact high-quality combined heatsink makes a great contribution into improvement of the thermal parameters). Nevertheless, it's not able to outscore the others in performance/noise ratio. CUD-725 is a top cooler for Socket A from Evercool, and it has a more sound exterior than its junior brothers. 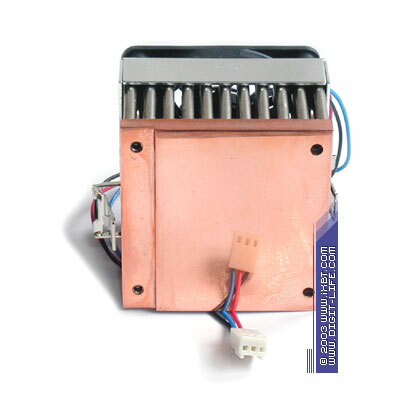 The solid copper heatsink, 70x65x35 mm (55x65 mm base) with considerable fin parameters and high-quality processing based on the bonded-fin technology, as well as an impressive fan, 70x70x25 mm, look really catchy. CUD-725 has excellent scores and gets into the group of leaders in thermal effectiveness. 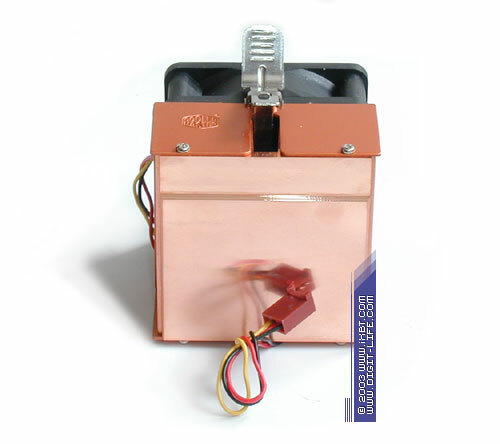 But the noise made by the fan with an aggressive impellar's design and a high rotating speed (4800 rpm) is very loud and throws the CUD-725 into the end of the technical rating. But thanks to its good thermal effectiveness and the moderate price it stays in the middle of the economical rating. ND16-610, CUC-610 and CUD-725 have potetially good talents, but noise they produce doesn't let them perform brilliantly. I hope Evercool will solve this problem soon.